On Tuesday, November 11, 1864, the initial petitioners for Dispensation met for their first official meeting. 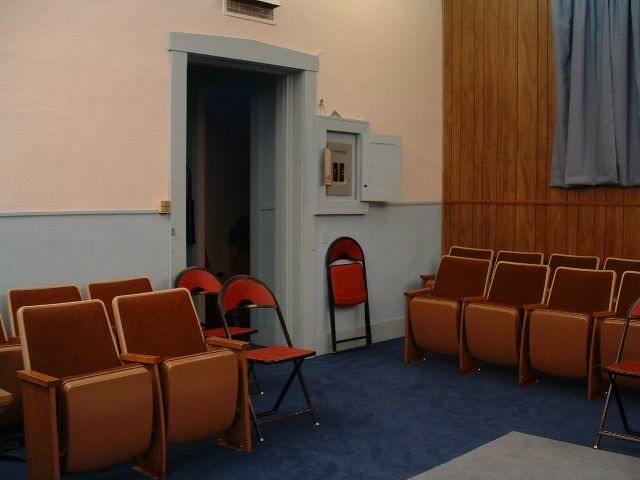 The first Lodge Hall was the upper room of the Davis Building, just two doors south of the present Lodge room. Jamestown Lodge was one of the early ‘moon’ Lodges which held meetings on Tuesdays before each full moon. 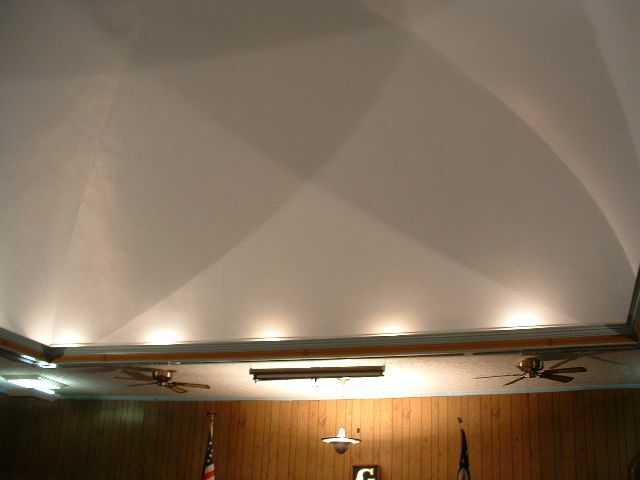 Since the Lodge remained opened all year this caused two meetings to be held in some months. In years like 1884, the Lodge met 13 times, twice in September (the 2nd and 30th). The second occurrence of a full moon in any calendar is called a ‘blue moon’, therefore extra meetings were held by Jamestown Lodge once a blue moon! On July 21, 1900, Brothers J. L. Ginn, J. H. Sanders, and Jess Taylor, Trustees of Jamestown Lodge #352, were instructed to enter into an agreement to build our present Lodge room for the sum of $2,000.00, and to sell the old Lodge room to the same firm for the sum of $40-0.00. In 1938, Right Worshipful Brother Harry B. Pickering was appointed as District Deputy Grand Master of the 8thMasonic District. Right Worshipful Brother Royce Pauley was installed as District Deputy Grand Master of the 8th Masonic on November 2, 1972. 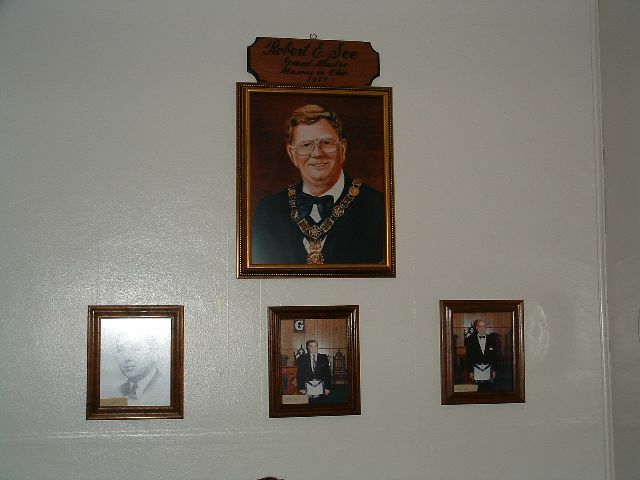 On November 4, 1989, Right Worshipful Brother Waiter R. Jones was installed as District Deputy Grand Master. 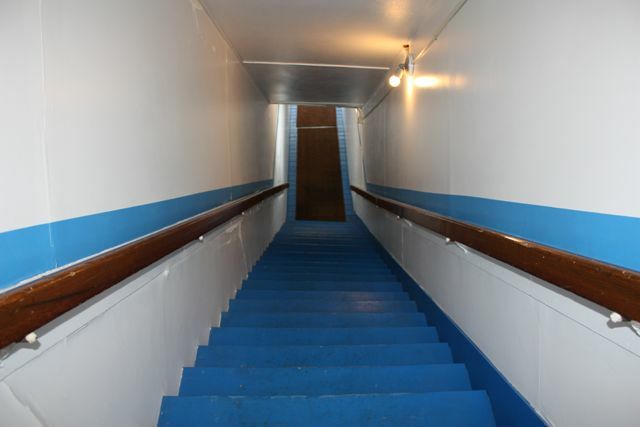 With continued remodeling and redecorating, the building has been kept in a good state of repair to the present day, and membership has grown from the original 58 members to 104 at the present time. 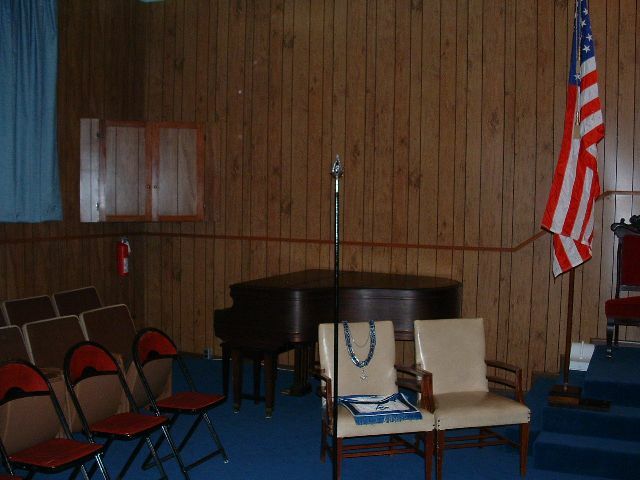 Jamestown Lodge No. 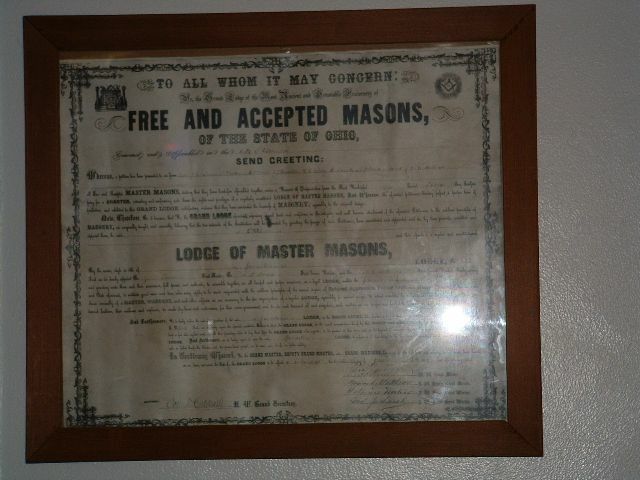 352, Free and Accepted Masons, was chartered on October 18, 1865, with the following charter members: J. W. Pulliam, M. O. Adams, G. W. Wright, J. T. Houston, H. H. Gibney, E. Doherty, A. D. Dowden and J. R. Kendall. 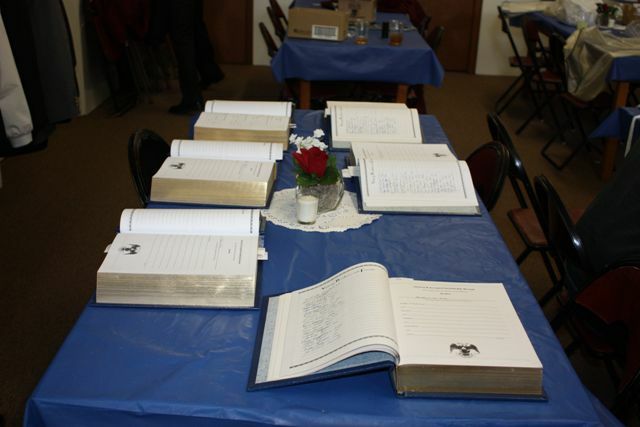 The first officers included the following: J. W. Pulliam, worshipful master; A. D. Dowden, senior warden; M. O. Adams, junior warden; J. T. Houston, treasurer; D. N. Foreman, secretary; J. R. Kendall, senior deacon; Samuel Zortman, junior deacon; John Zeiner, tyler. The lodge owns the second floor of the Adams store building, where it has well-appointed quarters for the work of the lodge. The order expended approximately three thousand dollars for its share of the building. 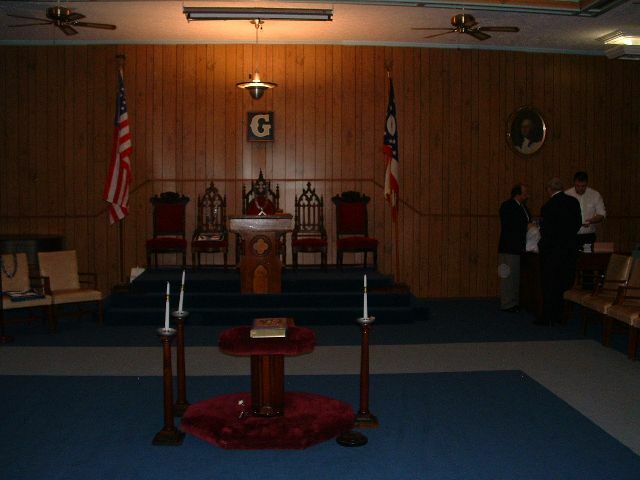 The present officers are Frank Johnson, worshipful master; H. L. Bowermeister, senior warden; H. C. Fisher, junior warden; M. T. McCreight, treasurer; J. D. King, secretary; Otto Thorpe, senior deacon; J. Leroy Spahr, junior deacon; F. W. Ogan, tyler; C. E. Thuma, master of ceremonies; J. H. Sanders, L. C. Walker and J. H. Perry, trustees; C. E. Thuma and C. E. Ream, grievance committee; R. H. Glass and J. H. Perry, stewards. 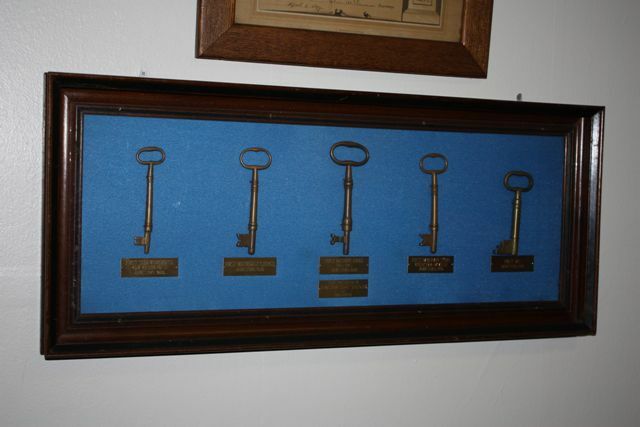 The past masters of the lodge are J. W. Pulliam, J. T. Houston, John Zeiner, G. E. Bailey, D. M. Shrack, W. F. McMillan, F. W. Alden, J. B. Christopher, W. H. Blair, L. C. Walker, W. A. Paxson, M. J. Flannery, Frank McGuire, R. W. Christy, Charles Clark, H. K. Laird. C. E. Thuma, Frank Shigley, F. W. Ogan, J. D. King, R. H. Glass, C. E. Gerard, J. H. Perry, L. W. Dunham, G. K. Dennis and Otto Thorpe. The present membership is ninety. 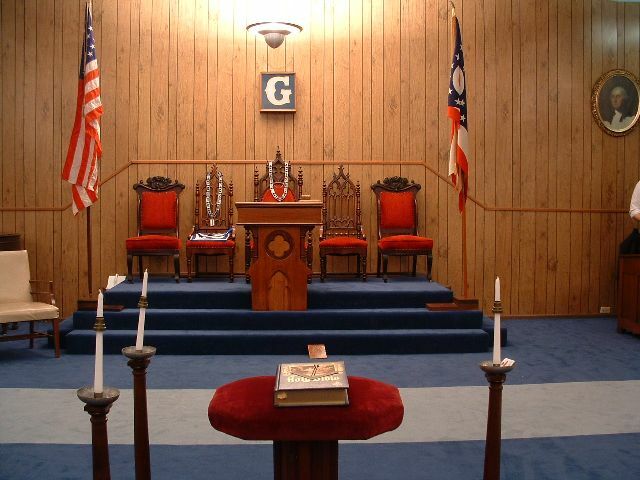 A group of Masons — led by Joseph W Pullum, Adolphus D Duden and Morgan O Adams — met for the first time as Jamestown Freemasons on November 14, 1864, under special Dispensation from the Grand Lodge of Free and Accepted Masons of Ohio. In the first year of its existence, Worshipful Brother Pullum read 39 petitions for advancement our fraternity, and the founding Brethren wasted no time in beginning their degree work. Thomas H Adams and John M Taylor (Entered Apprentices from Xenia #49) were Passed to the Degree of Fellowcraft during the very first tyled meeting. 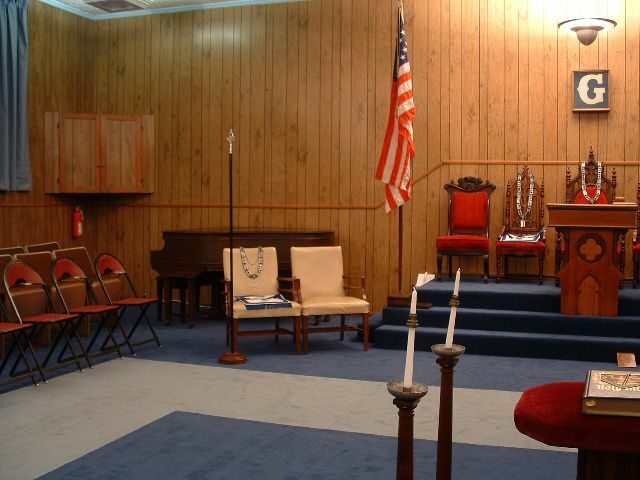 They hold the honor being the first candidates for any Masonic degree in this new Lodge. The exhibition of work took a remarkable upturn on the second meeting. On December 13, Brothers Adams and Taylor returned to be Raised to the Sublime Degree of a Master Mason. Followed closely behind them, John C McMillen and Lisben L Syfers (both from Xenia) received their Fellowcraft Degrees. And then four Initiates became the first Entered Apprentices of a country Lodge barely six weeks old: Thomas Haughey, Elijah Huzzy, William S Johnson, and William B McClain. Throughout 1865, Jamestown would continue an impressive speed of degree work. These numbers certainly appear staggering. It’s difficult to imagine fifteen Entered Apprentice ceremonies between April 4 and June 6, or even the 42 TOTAL degrees between April and August. But one must also keep in mind that the Ritual of the time was different than it is now. Before there was a uniform Code for the state, many Lodges naturally evolved their own Ritual through repetition and instruction. Indeed, these variations were also brought from other Masons from the Eastern seaboard, by demits from other states, and through travelling lecturers. 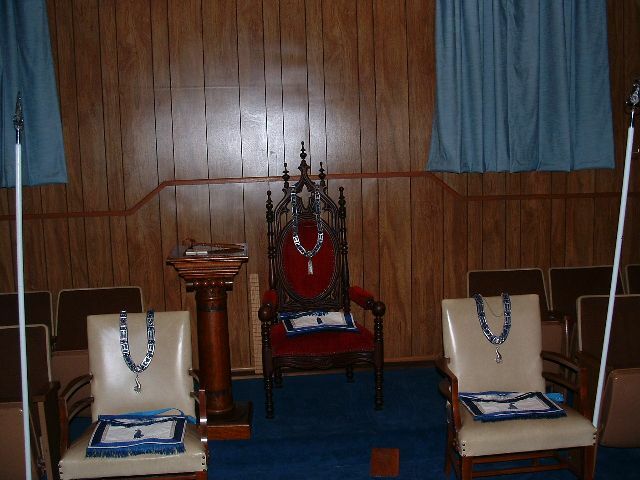 Influence on the Ritual came across the ocean as well, from the two competing Grand Lodges in England (prior to the formation of the United Grand Lodge of England in 1813), as well as the Grand Lodges of Ireland and Scotland – all four of which had chartered Lodges in the New World before the modern, state Grand Lodge jurisdictions were established. While the Ohio Grand Lodge did established a uniformed Code in 1859, there was resistance to its initial spread. Many Lodges – and specifically our bull-headed Brethren – either preferred the Ritual they had been taught, or else found it difficult to ‘unlearn’ what they had already committed to memory. So while the state had adopted a uniform Code, it’s very likely that even the men of Jamestown maintained their own variations through the original degree work of this Lodge’s first, highly-active year. Especially in the case of the Master Mason Degree, this fact is evidenced. Abroad in 1865, a Russian playwright worked on a novel that would become arguably the greatest novel ever written: Leo Tolstoy released War and Peace. And Lewis Carroll in England published Alice’s Adventures in Wonderland. But in America, John Wilkes Boothe placed a gun to the back of President Abraham Lincoln’s head. We were a nation reeling with shock and sorrow. Tragedy wasn’t far from Jamestown Lodge in its first year of operation. 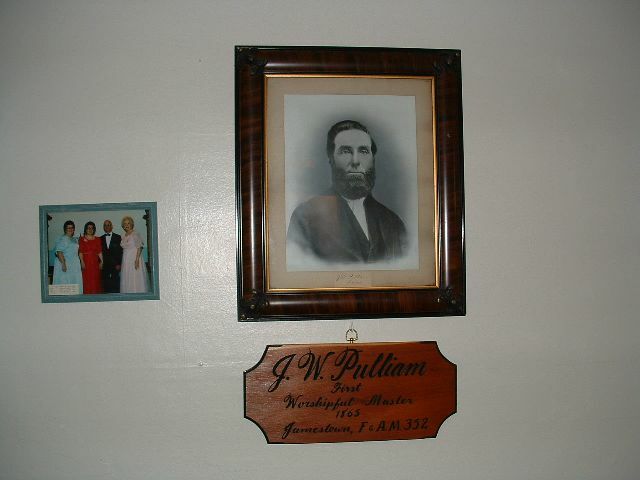 On September 5, 1865, the Lodge passed a motion for aid for Worshipful Master Joseph Pullum, who had sustained losses not only by fire but also by thief. 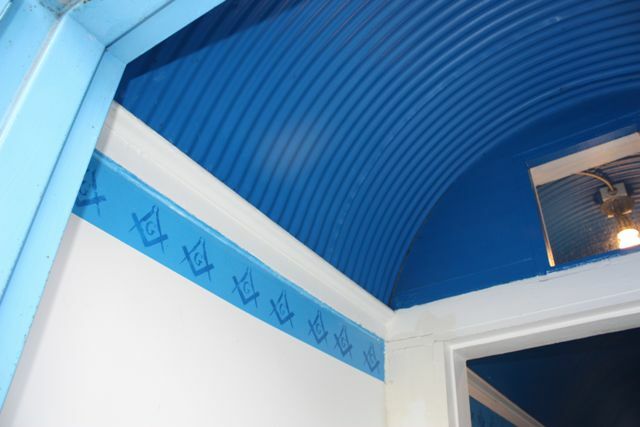 One can only imagine this tragic event pulled the Brethren of this new Lodge together into an even tighter group. By the exercise of Relief, Jamestown continued as a beacon of aid and support in an unforgiving world. Between 1865 and 1882 — just 17 years — the Lodge granted aid 24 seperate times. 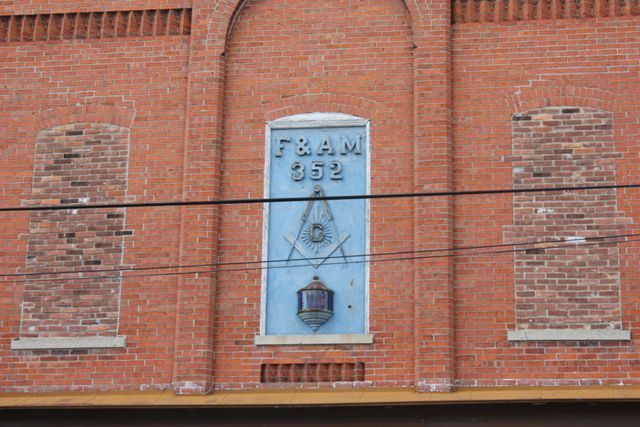 11 benefited Brethren from around Ohio and beyond, 7 assisted Lodges (3 building new halls), 3 to the families of late members, and 3 to help fund Masonic projects. Only once was aid refused. The minutes of September 2, 1873 solemnly state that “the scarceness of funds in the Treasury” was the cause for our first ever denial. A collection was taken up from those present, though no total was ever specified. 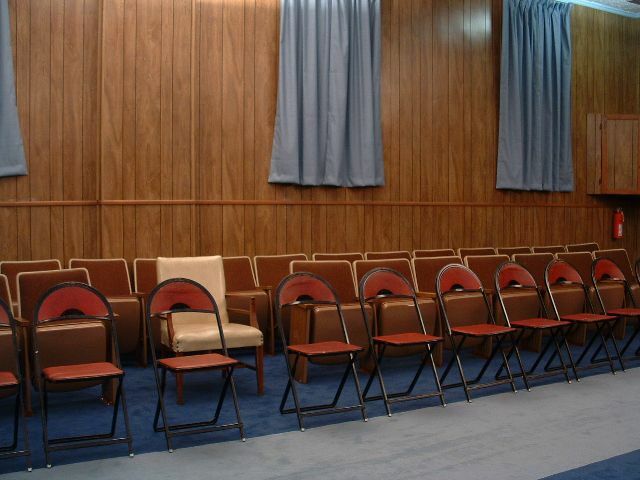 For many years, details into individual meetings are sparse, at best. The necessity for meticulous note-taking was absent during the tenures of our first few Secretaries, and conditions in the minutes didn’t improve until Brother William K Shifflet took over in December 1882. Before Shifflet, no one sat at the desk for more than three terms in succession. He maintained his seat until November 1898 — sixteen years. In fact, many times in the oldest ledgers ONLY the grant of aid was deemed worthy for posterity. Reasons for the aid were periodically scrawled across the page — widows and orphans; yellow fever; a fire in Michigan; ‘a National Masonic Educational Instute for Orphans of Masons.’ The amount sent to each weren’t always specified, and there were times when the minutes reflected only the fact that a collection had been taken from all those present. It is interesting to note that in the same year that Jamestown Lodge sent aid six times (the most in any given year thus far), The Ancient Arabic Order of Nobles of the Mystic Shrine was founded in New York. 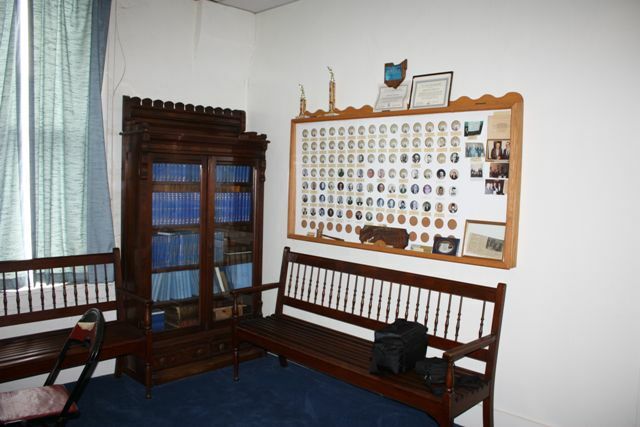 From the Shrine’s origins in 1870, they are one of the most recognizeable Masonic branches in the world today whose charitable endeavors are inspiring and truly life-saving. On May 3, 1884, a committee was established to receive “funds for the relief of the members who suffered loss from the effect of the late tornado.” In all, 18 Jamestown “Master Masons in good standing” received the help. The following year, on September 22, the remainder of the tornado fund was given to Fayette #107. It was also reported on July 18, 1940 that Brother Delvan E Hilton was in the hospital at the Soldier’s Home in Dayton, yet he was “getting along fine. Brother Nelson also reported that he took Brother Hilton a box of cigars, as ordered by Lodge.” …I’m sure his doctor was most appreciative. Our Jamestown Brethren assisted in the war effort during WWII. Through the last half of 1942, the dining room hosted members of the Red Cross “for the purpose of making bandages for war work.” Along with numerous donations to the war fund, they installed a stove for the benefit of the Red Cross workers. An F5 tornado touched down in Trumbull County, Ohio on May 31, 1985, and it travelled 47 miles through Ohio and Western Pennsylvania. Aid was immediately and unanimously approved at the very next meeting, June 20. Election Night in November of 1866 witnessed Brother James L Houston succeeding Worshipful Brother Joseph Pullum in the East. Houston became the second Past Master of Jamestown Lodge, a title that wasn’t handed over lightly by our Founding Brethren. All the way up to Election Night in 1882 — 18 years — only FIVE men would serve as Master of Jamestown. John Zeiner’s seventh term as Worshipshful Master in 1882 would serve only to drape the East in sadness as our Brother passed away while in office. Worshipful Brother Shrack, by special dispensation from the Grand Lodge, stepped in to finish the year. By 1892, W A Paxson became the eleventh Past Master and sat at the beginning of a Jamestown first: four new Masters in quick succession. M J Flannery followed Paxson in 1893, then Frank McGuire stepped up in 1894, and finally R W Christy sat down in 1895. 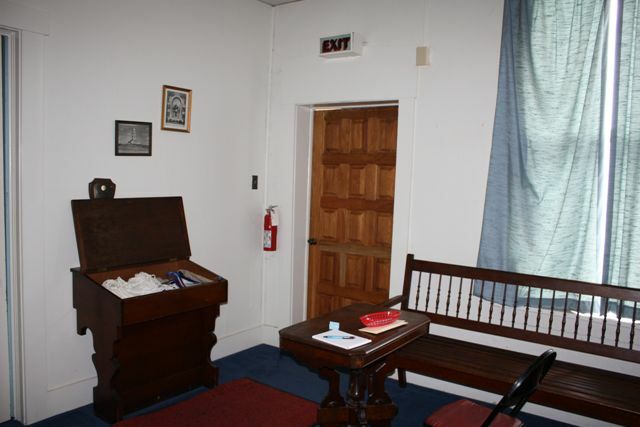 Two Brethren sat in the East seven times each — Dennis M Shrack and John Zeiner. Only three have come close, each serving as Master four seperate times. Six men have served the East three times each. Fourteen have stepped into the hot seat twice. As Worshipful Brother Joseph Pullum stepped back into the East (for the final time) in 1868, Albert Pike worked on the final revisions to “Morals and Dogma,” the degree system that would become the Ancient and Accepted Scottish Rite. Alfred Nobel had already patented dynamite, Alaska had been purchased, and Nebraska obtained statehood. The Election in November of 1870 was the first time that ALL officers (aside from the Tyler) had previous officer experience of some kind. 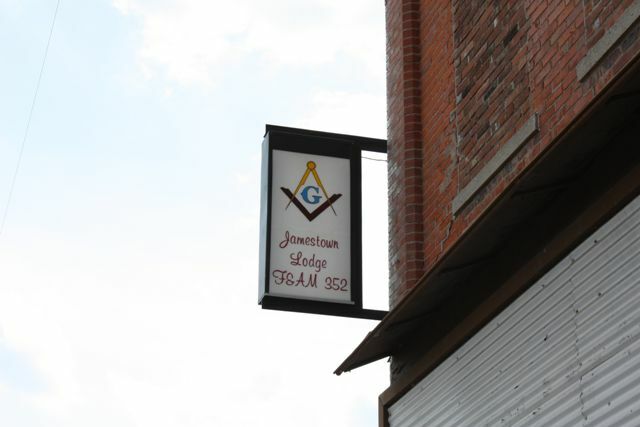 On April 16, 1872, the Brethren passed a motion to grant a dispensation for Jeffersonville Lodge. In that same year, the growing number of petitions necessitated the use of more special meetings than ever before. In 1872, 21 total meetings were held, including four within a two-week span in October. Also for the first time in recorded history, Jamestown closed down for two consecutive, summer months (June & July of 1876). After his final stint as Master, Worshipful Brother Pullum went on to serve as Senior Deacon in 1869 & 1870, as well as Trustee in 1869 & 1872. On March 11, 1873, he was suspended for non-payment of dues, but was promptly reinstated the very next meeting. He enjoyed a quieter time in Jamestown Lodge before demitting out in September 18, 1877. Adolphus D Duden — our first Senior Warden — had a much rockier membership. He was suspended for non-payment of dues on February 12, 1867, although reinstated a month later. Duden was again suspended on January 26, 1869. There is no mention of his reinstatement, but it was clearly a detail overlooked by the presiding Secretary because he reprised his role as Senior Warden in 1872. A few months after stepping down from his post, he was expelled for un-Masonic conduct (March 11, 1873). The short tenures of these men — within the Lodge that they helped establish — should not be looked upon as bleak or sad. Rather, all three should speak to the travelling craftsmen in all of us. Their mark has been left in the walls and the seats around us today; they are the reason you’re reading this 150 years later. 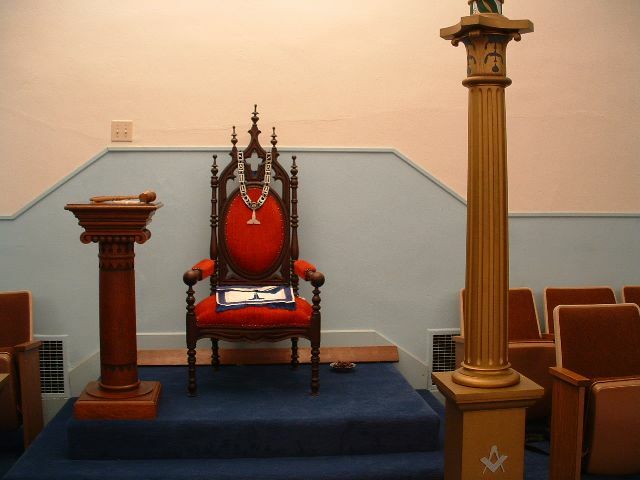 Whatever accomplishments which came before in the lives of these Masons — and whatever followed — will never have the same effect on every single man who has been Initiated, Passed and Raised in this Lodge. Their time, effort, patience, zeal and dedication has lived on to change the lives of every man lucky enough to call himself a Jamestown Freemason. The election of November 1869 is an important one, because ALMOST ALL of the major players of the next dozen years are shuffled into positions of leadership, and they would shape Jamestown Freemasonry into the very definition of Masonic excellence. (In fact, the only remaining name missing from this list is only two years away from turning in his petition — Dennis M Shrack would be duly Initiated on May 21, 1872). After returning to the Senior Warden’s station during the previous election, John Zeiner decided that he was finally ready to take over the reigns of Jamestown Lodge. He would leave behind him a short but incredible legacy as the third new Worshipful Master. Within the next twelve years, Zeiner sat in the East seven times. His first four years happened in quick succession, four years in a row. He remains the ONLY Master to sit in the East more than twice without a break. 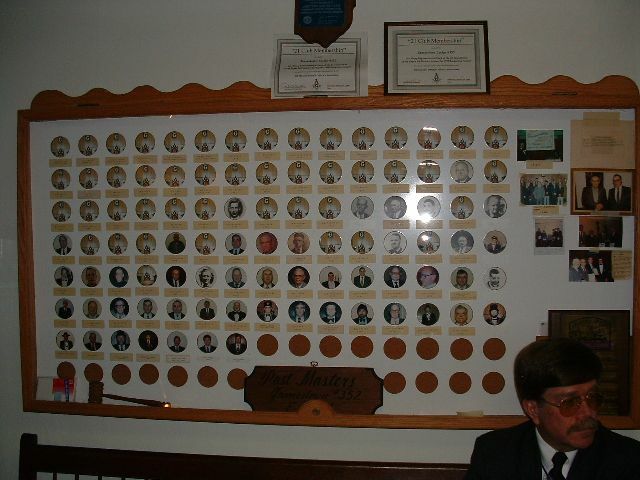 The rest of the officer’s line is a celebrity snapshot, yet their list of offices held fails miserably at commemorating their contributions from meeting to meeting, for years. On April 16, 1872, these are the Jamestown Brethren who passed a motion to grant the dispensation for the Brothers in Fayette County to organize Jeffersonville #468. The petition addressed to the Grand Master was presented, and the recommendation granted to establish their Lodge on September 10 of the same year. A group of gathered Masons is boisterous with conversation and laughter, and that’s a tradition that predates even Anderson’s Constitution! 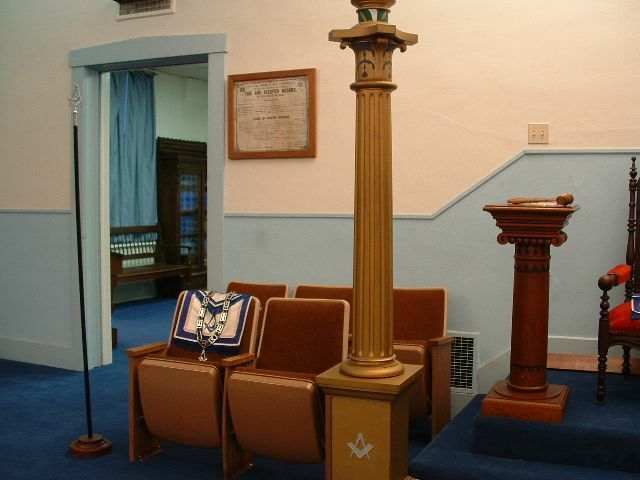 Jamestown has proudly maintained this unwritten pillar of the Masonic community. The Brethren called the Lodge to refreshment and enjoyed an oyster dinner at Florence & Strongs on January 7, 1879 (followed by cigars and candy at Brother M L McCreght’s store, then they resumed work in the lodge room). After Raising Brother Frank McGuire on July 17, 1891, the Lodge – consisting of more Masons than previously recorded – “repaired to the Wickersham House and banqueted in right royal style.” And they continued the practice of feasting like kings on various wild game, donated goats, hunted rabbits, and a “water mellon feast” (among many others). A Father and Son Banquet became a favorite event nearly every year through the 30’s, 40’s, 50’s and 60’s. Jamestown members were also present at several cornerstone layings. While most of the details about these events have been lost or were otherwise never recorded, a few instances do survive within our many ledgers. One such instance was the Bowersville School House cornerstone ceremony on June 7, 1915. While details were not initially contained, a motion was carried “to secure a copy of the Greene Co Journal which contains report of the laying of the cornerstone.” This can be found attached to page 240 in the ledger dated May 11, 1905 – January 4, 1917. Another entry in the minutes from April 16, 1936 merely states that a committee was“appointed to see about the laying of corner stone for the new school building.” And our Brethren were invited by West Milton #577 to the laying of the cornerstone for a new school building on June 21, 1938. 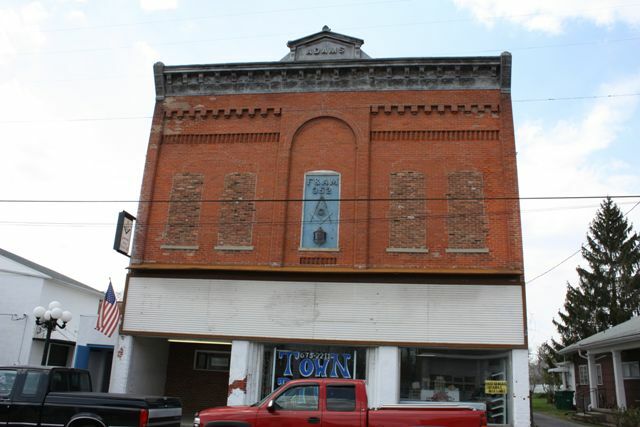 When the Village of Jamestown government offices sought to move out of the old Opera House in October 1996, the Brethren were on hand for the cornerstone laying. Jamestown was a Lodge of Masonic education and philosophical discussion since its Founding. 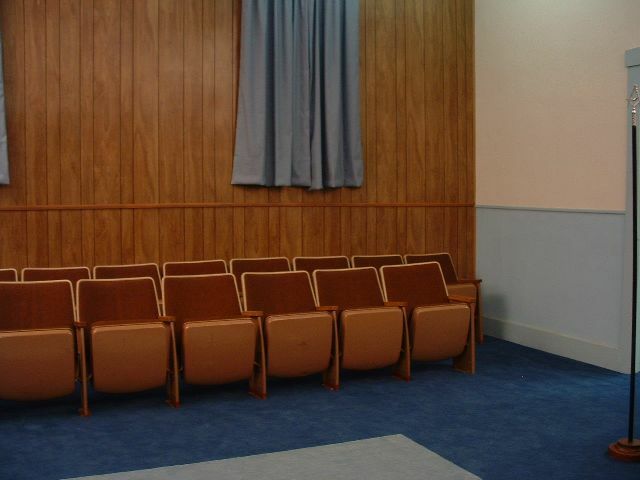 To that effect, many presentations were brought before our Brethren for mental digestion. 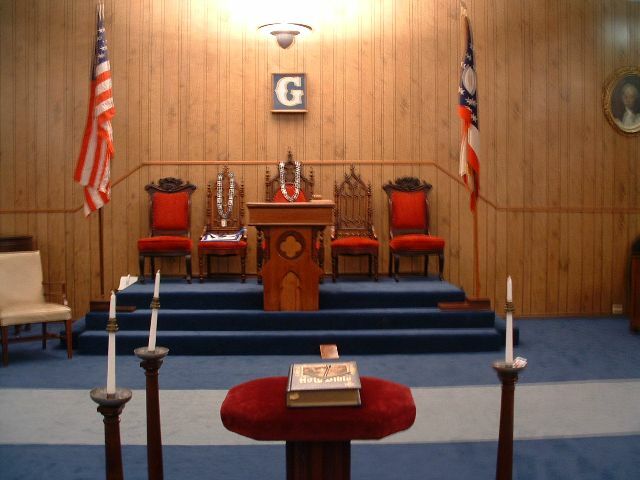 On April 8, 1873, Granison E Bailey “entertained the Lodge with a description of King Solomon’s Temple and the manner by which it was built.” And Brother H Camp of Olseago #285 (Olseago, Michigan), “delivered an appropriate lecture on the history of Masonry,” at our Installation of Officers on November 29, 1882. 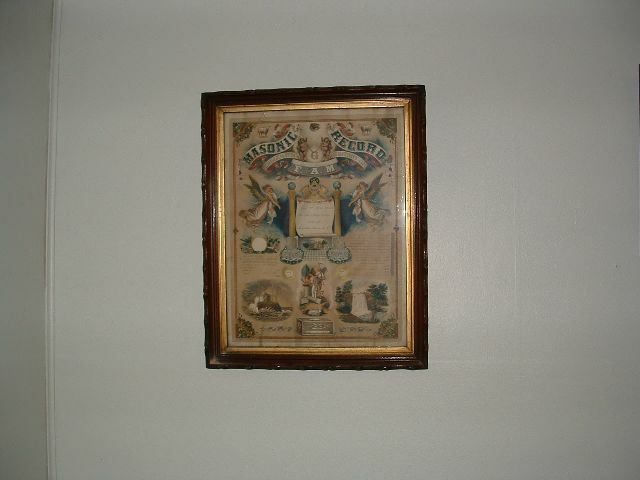 Brother Jesse Taylor – from a lodge in Kansas – sat in on a meeting, and expressed his thanks to the lodge for a allowing him “to sit in the lodge room in which his father had been made a Mason,” December 27, 1895. His father was John F Taylor, who was one of two first Fellowcrafts and one of two first Master Masons EVER to be Passed and Raised (back in 1864). “Quite a good social discussion took place under miscellaneous business in regard to the ‘Code’ and the teachings of the order and many other good things pertaining to the order. This discussion was free, and almost all the Brothers entered into it, and taken as a whole it was an excellent meeting and a goodly number of the Brothers were in attendance,” March 16, 1905. Ray N Linton “gave talk on the Masonic Service Center for the Army at Lawton, Oklahoma,” on December 18, 1942. And on May 31, 1945, Robert Lee Ringer was on furlough and talked about the Masonic Club at Guadiqual Canal, where he was stationed. An unknown, visiting Mason from an unspecified lodge presented newly-Installed “Worshipful Master Max Wallace with a book from the Scottish Rite of Miami Valley to record his year’s activities,” January 17, 1963. 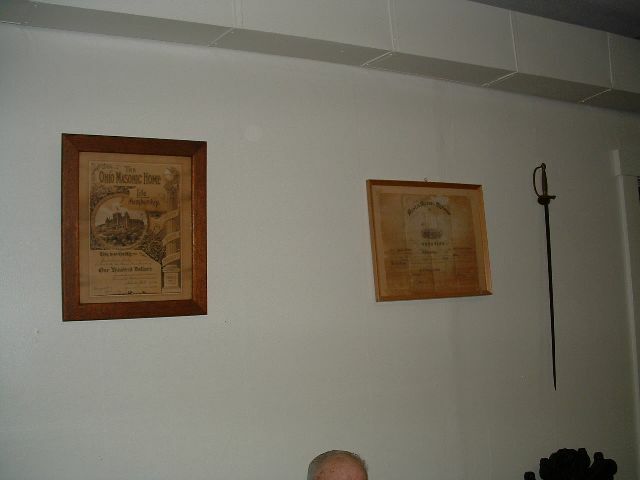 Then on January 7, 1966, Illustrious Brother Robert Clark, Most Wise Master of The Chapter of the Rose Croix, attended the Fellowcraft Degree upon Brother Curtis Grider. 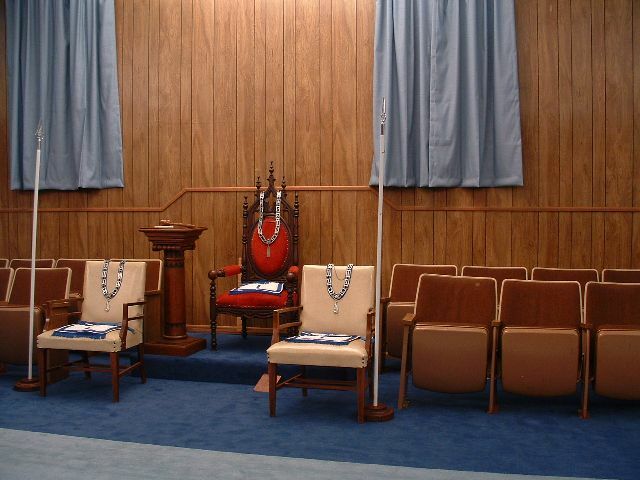 “Right Worshipful Brother Billy Joe Jones, Grand High Priest, gave a short talk of Royal Arch Masonry and the need for members in that fraternity,” September 15, 1988. 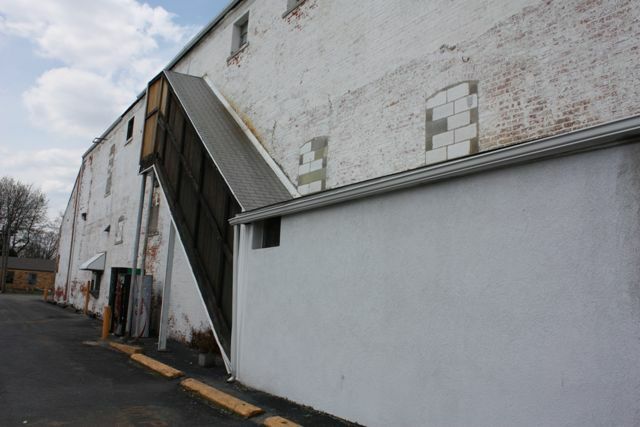 Modern Masons are perfectly aware of the headaches from a building’s monthly maintence and the annual budget restrictions that hinder those efforts. The first time the Jamestown ledgers reflect upon this well-known concern, a motion to insure the Masonic Hall was carried on September 23, 1879. Much would follow. Every 3-4 years, a committee was routinely appointed for the purpose of redecorating the lodge room, ante room, or dining room. 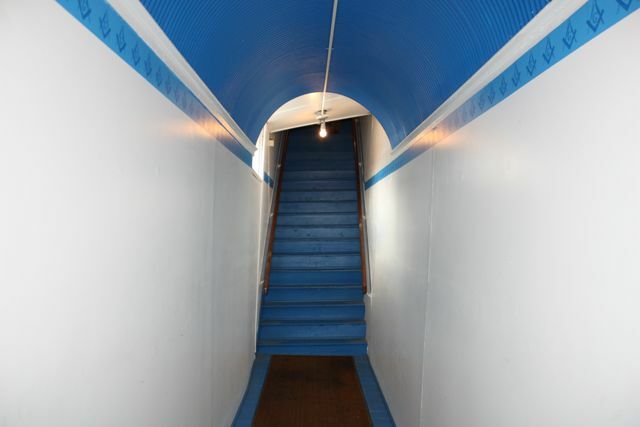 Sometimes this only included painting and hanging pictures, other times, however, they were much more specific in their committee demands — like changing the outside hall door to swing outward (October 13, 1910, been that way ever since), or laying an asphalt tile floor in the dining room (January 20, 1955). New regalia and working tools, January 31, 1882. New altar, January 16, 1883. Our first increase in annual dues was to $4 and was adopted into the by-laws on August 14, 1883. Our first meeting night switch was from Tuesday to Friday (March 24, 1891), then to Thursdays (October 5, 1900). It was changed from the 1st Thursday to “on or before the full moon” (December 15, 1911), and finally to the 3rd Thursday on January 20, 1921. Coal box and urinal removed, December 31, 1909. Old organ sold, October 9, 1913. New lesser lights and robes, November 21, 1913. Roof repairs mentioned for the first time, May 14, 1914. New book shelf for Grand Lodge reports, June 21, 1928. New kitchen stove, July 18, 1929. 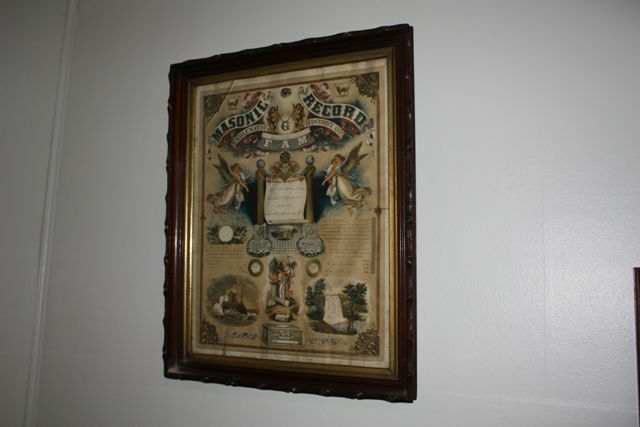 Framed our Charter, December 17, 1932. Installed pool table, May 20, 1949. Within these same walls, it’s difficult for many of us to picture Jamestown Lodge with a pool table, or an organ, or even working tools fashioned before 1882. Still, we continued to grow, modernize, and evolve with an ever changing world. “A donation from the OES of $15 to help purchase carpet for our anti-room was presented and on motion it was accepted and a note of thanks returned to this order for same,” December 27, 1906. “Trustees to see about insurance increase on building and contents, including the new carpet,” April 3, 1947. 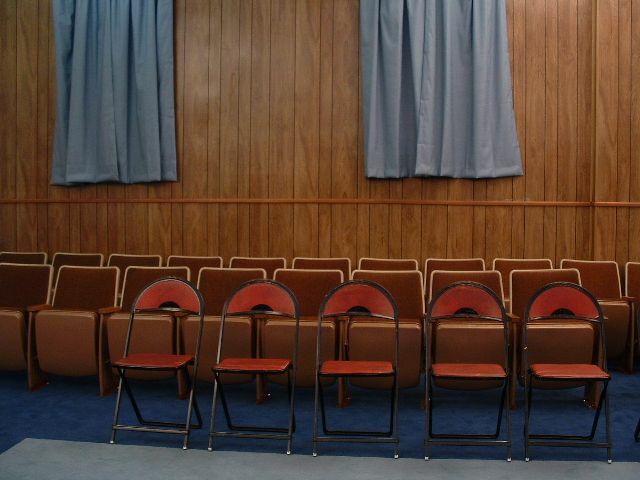 Three chairs were donated by Brother Neal Hunter for the three stations in 1950, “which originally came from the pulpits of two Jamestown churches.” Additional chairs were acquired from Wittenberg University on June 17, 1973. New windows were installed on February 20, 1969. It came before the lodge that “the glass in the entrance door had been broken a couple times, and [the matter was] referred to the Trustees for action,” March 19, 1981. The very first house built in Jamestown, Ohio was the Parker House property, and it was used at the time as a tavern. The tavern would later fall into the care of Zina B Adams, who later had four sons: Morgan O Adams, Samuel Adams, John Quincy Adams and Thomas H Adams. With the exception of Samuel, all three brothers were prominent Jamestown Masons and popular members of the community. Thomas H Adams built the structure which currently stands at 6 1/2 N Limestone Street around 1865, around the same time that Jamestown Lodge received its Charter. All lodge furniture and paraphenalia were ordered to be moved to our current premises on January 31, 1901. 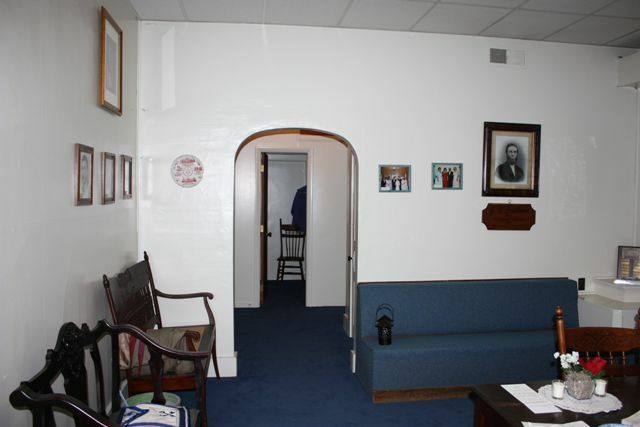 The Brethren (led by Leonidas C Walker) didn’t wait long to invite everyone around for a glimpse of the new lodge room. During a Special Communication on March 5, 1901, we were “assisted by Most Worshipful Brother Allen Andrews, Past Grand Master, and Brother S B Ercus, District Lecturer, as well as a constitutional number of members and visiting brethren from Xenia Lodge #49, Leonare Lodge, Sabina Lodge, Fayette Lodge, New Burlington Lodge, and others …to dedicate our new lodge” and to raise Brother Charles W Sharpe. The Jamestown Lodge history thus far has stepped forward and backward in time whenever a subject begged to be explored. However, we have now arrived at a point where all those storylines have marched AROUND many of our noteworthy milestones. Following are a few highlights which perferate everything you’ve read so far, and a few snippets from the world just beyond the lodge walls. On May 4, the first game of Major League Baseball is reported to have been played. A few months later on August 29, the Brethren passed a motion for aid from J F McKinney to establish National Capital of a National Masonic Educational Institute for Orphans of Masons. In the same year that the exterior, stone structure of the Washington Monument was completed, notes were scrawled in the ledger that Jamestown Lodge closed without doing any business at all (July 1), citing that “the weather being almost oppressive and no business of importance” was deemed worthy of the break. A motion was made on February 21 to hold meetings every two weeks. 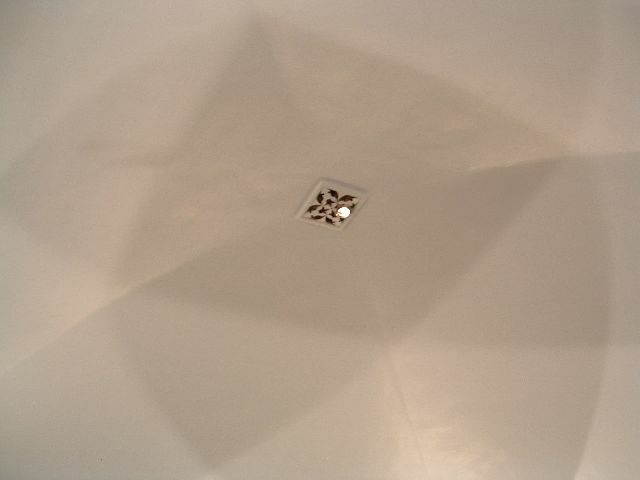 Worshipful Master Jason B Christopher immediately declared this “out of order.” Then in November, the Washington Memorial was open to the public. 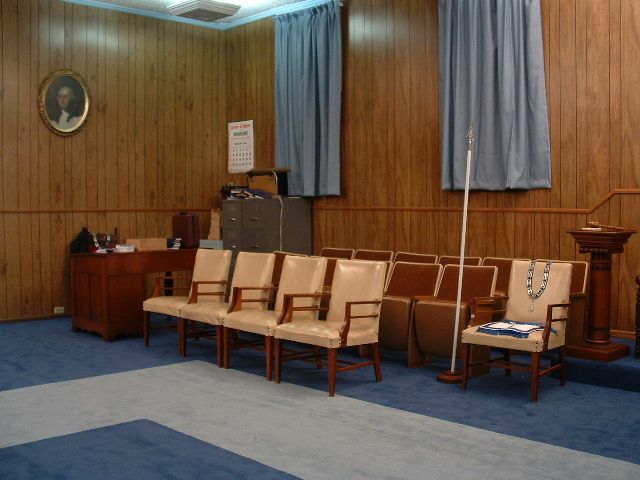 “Communication from twelve members of various lodges who reside at Cedarville asking Jamestown #352 to give consent to their forming a Lodge of F&AM to be [groomed] as Cedarville Lodge was read and laid on table for consideration,” December 19. “Petition for dispensation of Cedarville re-read and ballot ordered which was unanimous to granting request of said Brothers,” January 16, 1913. 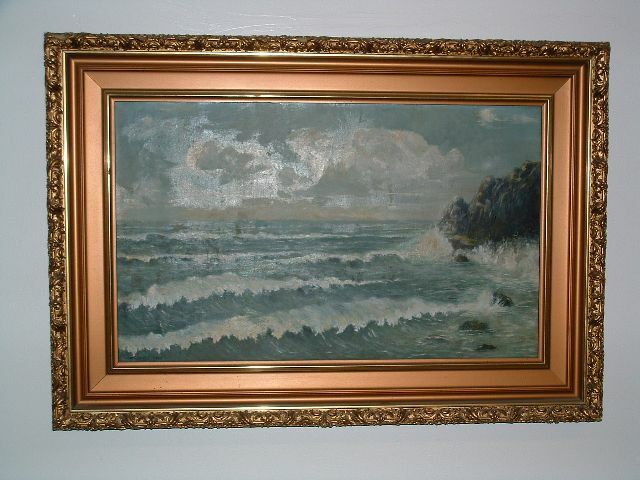 …A couple months later on March 25, four days of rain flooded the Dayton area. 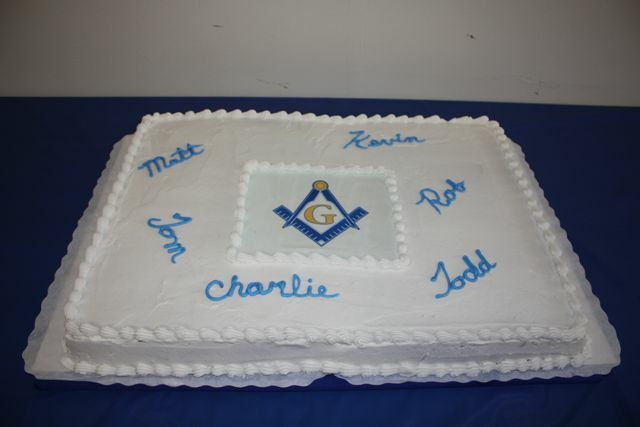 A banquet was held in honor of Frank McGuire following his promotion to the 33rd Degree, November 7. The Fellowcraft Degree continued anyway, and Brother Wilford D Seslar was Passed that evening. “This was indeed a red letter date for Jamestown Lodge #352, April 1, 1938, on account of having with us Bro Louis B Blakemore, The Most Worshipful Grand Master of Ohio, who gave us several very interesting talks, which were well received.” Mrs Blakemore complimented the meal of the Order of the Eastern Star, as well as the redecorating of the Lodge. On June 30 of the same year, Superman made his debut in Action Comics #1. On March 10, the Jamestown Brethren were facing a time crunch for conducting the funeral services of late Brother Orvin Glass. Their largest hurdle: Eastern Star’s Inspection had booked the lodge room. So, they re-arranged the dining room and held their heavy-hearted, special meeting with the kitchen appliances in audience. On November 4, the National Security Agency was founded. He would pass away while in office in June 1957 — 36 total years as Treasurer. Jamestown was visited by “Brother Penney of Osterley Lodge No 6430, of the Province of Middlesex, England, who is a commissioned officer in the Royal Air Force and at this time stationed at Wright-Patterson Air Force Base on an exchange mission… Brother Penney gave an interesting talk concerning Masonry in England and the English Provinces,” on February 17. A few weeks later in Montgomery, Alabama, fifteen year old Claudette Colvin refused to give up her seat on the bus to a white woman and was arrested. Racial tensions neared a boiling point. “The Worshipful Master appointed Junior Warden Brother Kenneth Fields and Senior Warden Brother Albert Liming as captains of opposing teams in a contest to improve our attendence. They are to choose sides and the side which has the best attendance record by the April meeting would receive a refreshment party to be given by the losing team,” January 17. A month before the results were tallied, the FBI arrested Jimmy Hoffa and charged him with bribery. 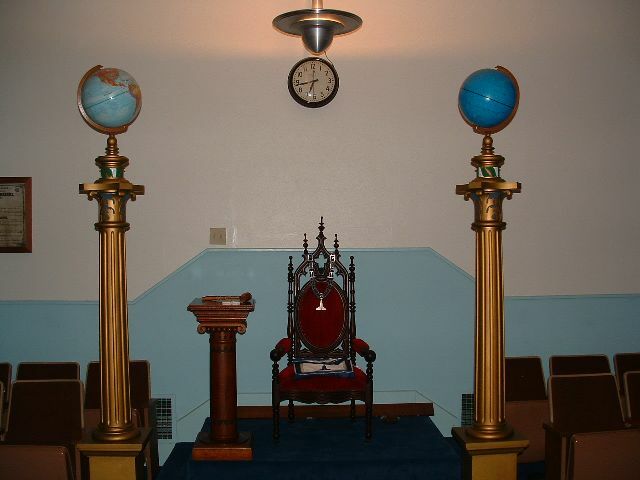 “Brother Royce Lee Pauley was examined in the Master Mason Degree. This was a self accomplished act as Brother Pauley asked the questions and answered them.” He was only the second member to do this. First there was Brother Eugene Turner, and he was the Mason who made the motion to accept Pauley’s examination as satisfactory on February 1. Just outside the walls of lodge room, “I Want to Hold Your Hand” vaulted to the top of the sales charts, and The Beatles became a household name in America. On April 2, “2001: A Space Odyssey” premiered in Washington DC. The Brethren passed a motion “to give an Assembly of Rainbow Girls permission to use the Temple for their meetings,” two days later. For Jamestown’s 125th Reconsecration, Most Worshipful Brother John W McKahan presided, and commemorative coins were minted for the occasion. NASA launched the Hubble Space Telescope the same year. Officials in Xenia, Ohio opened a time capsule on February 27. 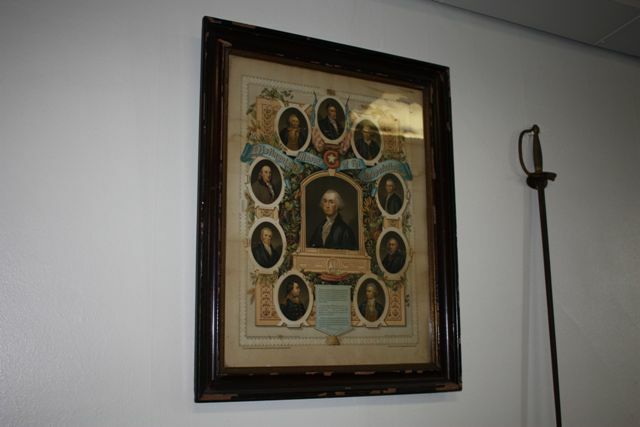 Among the locked possessions: A history of New Burlington Lodge F&AM, a note from Xenia Chapter 36, RAM, and a member list from Jamestown Lodge – all preserved from 1901. Copies can be found on page 92 of “Greene County Ohio: Time Capsule of 1901” by Gillian Hill. Only a few days beforehand, racing legend Dale Earnhardt died in a crash. The Loyal Order of the Royal Ohio Buckeyes was chartered on June 26. Merely twenty-four hours prior, King of Pop Michael Jackson passed away. Jamestown performed six Master Mason Degrees in one day, and it took the ENTIRE day. The Boy Scouts of America celebrated their 100th Anniversary. The Brethren of Jamestown carry on the torch lit by Joseph Pullum so many decades ago…. The leadership corps exemplifies the zeal and dedication required to not only manage the lodge today, but also to strengthen it for tomorrow. 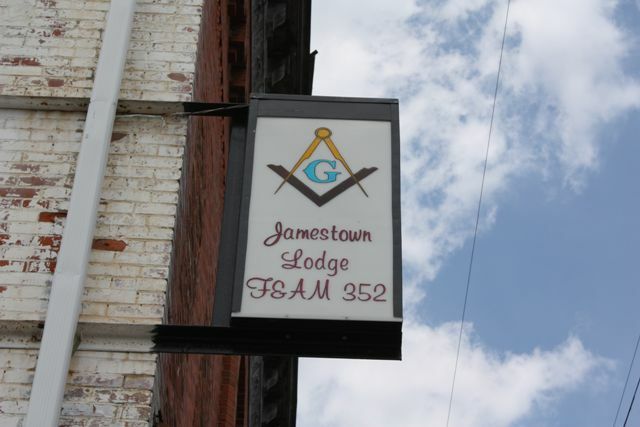 The Grand Lodge of Free and Accepted Masons of Ohio is surging through its 208th year — here in the 8th District, Jamestown Lodge thrives as a shining example of Freemasonry in the modern world. By upholding the invalueable tenents of Brotherly Love, Relief and Truth, the membership of this small, country lodge has bonded as close as the Brethren who sat for its Founding in 1864. Led by Worshipful Brother Kevin Basinger, the future of the Craft in this small town has never looked so promising! And we thank The Great Architect for allowing us to be part of such an impressive history!